Gay History - October 15th: Virgil, Foucault, Cole Porter, and Lucille Ball. 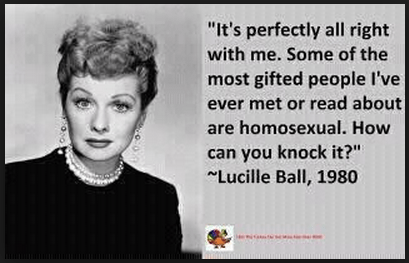 Home/Gay History/Gay History – October 15th: Virgil, Foucault, Cole Porter, and Lucille Ball – Lucy, Honey I’m HOMO! 70 BC: Virgil an ancient Roman poet of the Augustan period is born. Virgil is traditionally ranked as one of Rome’s greatest poets. His Aeneid has been considered the national epic of ancient Rome from the time of its composition to the present day and his works had a deep influence on Western literature, most notably the Divine Comedy of Dante, in which Virgil appears as Dante’s guide through hell and purgatory. Many historians believe that Virgil was homosexual, and he had an especially close relationship with a man named Alexander, whom he wrote about in the guise of “Alexis”. 1926: Michel Foucault a French philosopher, historian of ideas, and literary critic is born in Poitiers, France. Foucault became active in a number of left-wing groups involved in anti-racist campaigns, anti-human rights abuses movements, and the struggle for penal reform. He went on to publish The Archaeology of Knowledge, Discipline and Punish, and The History of Sexuality, his so-called genealogies which emphasized the role power plays in the evolution of discourse in society. Foucault died in Paris of neurological problems compounded by HIV/AIDS; he was the first public figure in France to have died from the disease, with his partner Daniel Defert founding the AIDES charity in his memory. 1951: I Love Lucy premieres on CBS. 1952: Members of the Mattachine Society form One, Inc. to promote gay education and research. In January 1953 ONE, Inc. began publishing ONE Magazine, the first U.S. pro-gay publication, and sold it openly on the streets of Los Angeles. In October 1954 the U.S. Post Office Department declared the magazine ‘obscene’. ONE sued, and finally won in 1958, as part of the landmark First Amendment case, Roth v. United States.The magazine continued until 1967. 1964: Composer and songwriting legend Cole Porter passes away of kidney failure at age 75. Porter who was gay, or at the very least bisexual did indeed have a committed, lifelong relationship with his wife Linda, who knew he was gay from the start and not only tolerated but often encouraged his lifestyle–as long as he was not too flamboyant. In his career Cole Porter would write over 900 pieces of music. His Broadway hit musicals include: Anything Goes, Can-Can and Silk Stockings . 1967: Vikki Carr’s camp classic “It Must Be Him” enters the top-10 on Billboard’s Hot 100 chart . 1973 : The formation of the National Gay Task Force announced in New York City. The National Gay Task Force is later to be known as the National Gay and Lesbian Task Force, then changed again to just three words The Task Force in 2012 and then changed yet again in 2014 to the National LGBT Task Force and now in 2018 it is the National LGBTQ Task Force. Who knows maybe one day now 40+ years later when its done playing with its name it will actually find a “task”. 1977: The Santa Barbara, California, board of education voted to ban discrimination against GLB students, making it the first US school board to do so. 1977: Federal district court Judge Kimba Wood ruled that shareholders of Cracker Barrel Old Country Stores Inc. should be allowed to vote on retaining a company policy that would forbid employment of gays and lesbians. Now you know why its called “Cracker” Barrel. 1999: Washington Times columnist Cal Thomas reported that George W. Bush told a small group of conservative Republicans he would not knowingly appoint a practicing homosexual as an ambassador or department head if elected president. Unfortunately he was, and of course he didn’t. Australian Swimmer Ian Thorpe Annoyed At People Wondering If He’s Gay, Comes Out As Straight.